If you want to get a tone similar to Hendrix’s or you want to play his songs, this guide is for you. Copying Jimi Hendrix’s exact tone isn’t possible – even if you used the exact gear he used (which also changed over time). The goal of this guide isn’t to copy Hendrix’s tone exactly, the goal is to teach you how to think like Hendrix and produce a Hendrix-like tone that you will enjoy. 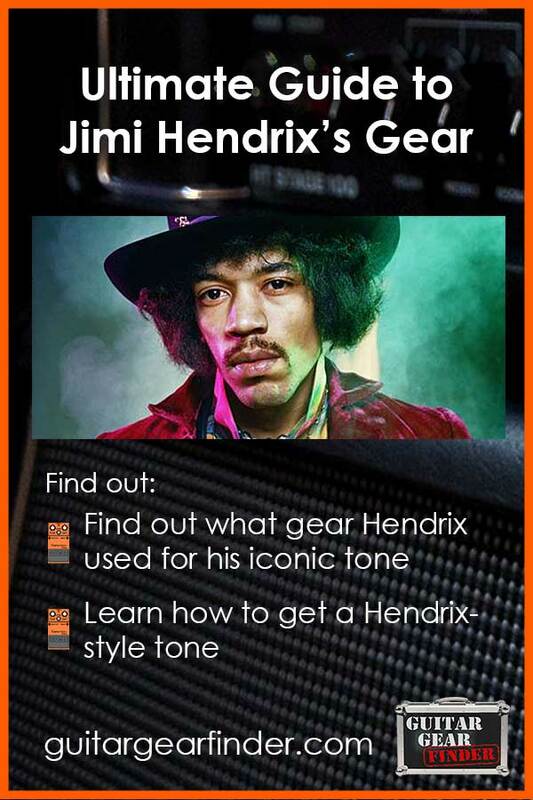 The modern gear I recommend throughout this guide will still be able to achieve a good Hendrix sound. You will also get all the extra benefits of modern gear (eg: smaller pedal size, more power options, true bypass). Unless you’re a vintage gear die-hard, you will enjoy using modern gear to produce a vintage Jimi Hendrix tone. Remember that the gear you use is only one aspect of tone – the other important aspect is how you use your gear and what you play on guitar. If your goal is to jam along with Hendrix songs or you want to produce a tone similar to his, keep on reading. Let’s start by looking at the rig Jimi Hendrix used in his famous performance at Woodstock in 1969. The reason we’re starting here is because it’s a very simple rig that gives you a good idea on the essential components to Jimi’s tone. Of course you don’t need the exact gear listed here – I’ll provide plenty of alternatives later on. Looking for exact models? At this point don’t worry about exact models for the amp or pedals. I will explain why it’s pointless trying to buy the exact gear and give you a few alternatives for all gear later. The order of the gear labelled also tells you how it’s all chained together. The guitar is connected to the VOX wah, which leads into the Fuzz Face, followed by the Uni-Vibe then into the amp. The coiled cable has a big impact on the tone Hendrix produced. Old coiled cables remove a lot of the higher frequencies which reduces the brightness you hear. Keep this in mind as straight cables you use will retain more of the higher frequencies. The iconic wah (also called wah-wah) is the first and most important piece of gear to produce a Hendrix-like tone. Have a listen to Voodoo Child (Slight Return) to hear a classic wah inspired song. If you have never played a wah pedal before, you’re going to love it! Read this lesson on how to get started with a wah pedal. It contains simple exercises to learn how to use a wah properly. Now let’s look at the type of wah pedals Hendrix used and what options you have available. Hendrix used VOX wahs and the Vox V847A is a popular option as shown above to the right. It’s a simple wah at a good price so if you’re simply looking for a basic and affordable option, the VOX is a safe choice. Check out the price and reviews of the VOX V847A here. Another alternative is the Jimi Hendrix signature wah developed by Dunlop shown above left. 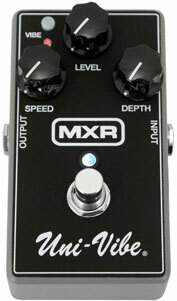 It’s a more expensive option but Hendrix fans have rated it as a good option to replicate Hendrix’s tone. As you can see from below it is more expensive so it really depends on whether you want a signature pedal or a standard pedal. While I have not had a chance to directly compare these two options, expect minor differences in tone overall. Of course, there are far more options and the truth is that almost any wah will be suitable. Die-hard Hendrix fans will point out that all wahs sound different and not like Hendrix, but for most guitarists, any wah will do. Two alternatives to consider is the classic Crybaby (read my review here) or if you can get your hands on one, the Dunlop Jimi Hendrix 70th Anniversary Tribute Series Cry Baby which is another signature wah developed by Dunlop. A key component to achieving a Hendrix tone is fuzz distortion. Hendrix used a Fuzzface pedal to add more dirt and drive to his amp. Fuzz distortion is very different to typical distortion or overdrive pedals. If you don’t have a fuzz pedal you’ll find it very hard to achieve a decent Jimi Hendrix tone. The Dallas Arbiter Fuzz Face pedal Hendrix used has been so popular Dunlop still produce them today. 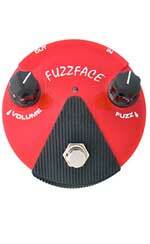 If you want the closest option to what Hendrix would have used, check out the Fuzz Face. The above pedal is promoted as an exact specifications replicate to the original that Hendrix used. So while it might sound like a great option to get an authentic Jimi Hendrix tone, there are issues to consider. First is that it only runs on 9v battery. There isn’t an option for an AC adapter unless you modify the pedal. This may be an issue for many guitarists who prefer using a power supply rather than batteries. The other issue is the pedal is pretty big and will hog up a lot of space on your pedalboard. If you only have a few pedals then that’s not a problem, but if you want to include it on a pedalboard just be aware that it will take up some space. Fortunately, there’s an alternative that aims to provide the same effect with a few modern benefits. The Jim Dunlop FFM2 is a Fuzz Face designed for a modern pedalboard. This means it’s far smaller, had a status LED and allows you to use battery or AC power. I would recommend this option for most guitarists over the larger Fuzz Face. Fuzz distortion is a crucial part of achieving a Hendrix tone so don’t skip this option. Of course, there are plenty of other fuzz pedals out there, but the Fuzz Face is the best choice for a Hendrix sound. To learn more about Fuzz distortion and different options, check out this guide here. The Uni-Vibe was created to simulate the sound of a Leslie speaker. Think of it as a chorus/vibrato/phaser pedal. This is again a key component to achieving a great Hendrix tone because it is such a distinctive and unique effect. You can use it to create lush, swirling, hypnotic tones or more subtly to add some unique texture to your tone. It’s a great addition to a clean sound and the first time you play Little Wing with a Uni-Vibe – you’ll see why it’s such an important effect to achieve a great Hendrix tone. Listen to Machine Gun for a great example of how Uni-Vibe shaped Jimi’s tone. If you watch the Woodstock performance you will hear it used throughout – especially during The Star Spangled Banner. If you’re a fan of 60s-70s guitar-based music, you will recognize the Vibe on many different tracks. David Gilmour of Pink Floyd used one up until the early 70s so you will hear it in early Pink Floyd work. Listen to Breathe off of Dark Side of the Moon for a great example of the Uni-Vibe in action by somebody other than Hendrix. If you’re also a David Gilmour fan, check out my Beginners Guide to David Gilmour to see what other gear he used. You can see that it’s a standard pedal size with three main knobs. A small button on the top left lets you switch between Chorus and Vibrato mode. Check out the price and reviews here on Amazon. The only disadvantage to these options compared to the original Uni-Vibe is that these pedals do not include an expression pedal. This means the speed of the effect cannot be changed during a performance as Hendrix would sometimes do. I’m sure there are options out there that do offer expression pedals – but you really don’t need it to achieve a great tone. The Viscous Vibe by TC Electronics does a feature that could be used in a similar way to an expression pedal. When the footswitch is held down, it ramps up the speed. Of course, it’s not the same as an expression pedal but can be used for similar effects. There’s one more essential effect Hendrix used that we haven’t looked at yet because it wasn’t included in his Woodstock performance. Check out the rig in the photo below and you’ll notice one new addition to the above effects. In addition to the VOX wah (A), the Fuzz Face (C) and the Uni-Vibe (D), this rig includes an Octavia (B). The Octavia (also known as Octavia Fuzz, Octafuzz and Octavio) was a prototype when Hendrix used it. It was designed by Roger Mayer – Hendrix’s sound technician. 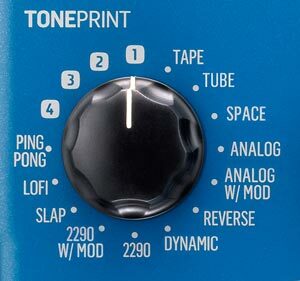 It mixes in an octave higher than the original input as well as add in some fuzz distortion. This is an essential Hendrix effect pedal to use and you can hear it throughout his songs from 1967 onwards. The best example is the solo in Purple Haze but you can hear it used in different ways in One Rainy Wish, We Gotta Live Together as well as many others. People normally imagine Jimi Hendrix holding a strat with a maple fretboard as shown above, but if you look throughout Jimi’s career you will see that the used a wide variety of guitars. He’s played Flying Vs, Les Pauls, SGs, Jaguars, and a range of acoustics. That’s why I’m avoiding the suggestion that you should be using a strat to achieve a Hendrix sound – because even Hendrix didn’t limit himself to one type of guitar. I recommend you experiment with different guitars and don’t feel that only certain guitars will achieve a Hendrix-like tone. Just remember: Hendrix also played SGs and Les Pauls! But if you’re going for the iconic Hendrix look – grab yourself any quality strat you fancy with a maple fretboard. Hendrix experimented with a wide range of amps so don’t limit yourself to only considering Marshalls. It should be clear by now that a crucial part of what made Hendrix unique is that he experimented a lot with his gear (and other things). He is usually associated with Marshall amps because that’s what he used towards the end of his life. But in the studio, you can bet Hendrix had plenty of different brands and models available. He was known to use Fender Twin Reverb and Bassman amps and he had at one point a contract with Sunn. 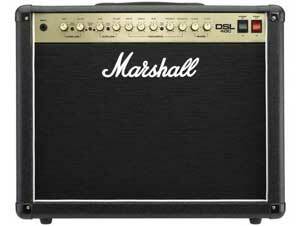 If money is no barrier and you want the real deal – check out the Marshall 1959SLP100 Plexi here. For the rest of us, it’s very hard to suggest an appropriate amp. Search any Hendrix fan forum and you will see guitarists arguing over which amps are appropriate for a Hendrix tone. Some people will tell you that no amp produced after the 70s will do a Hendrix tone. That’s only because Hendrix never played any of them! For a hobby guitarist just wanting to get ‘close enough’, any tube amp would be suitable. Having a tube amp is a key component of Jimi’s tone. Fuzz distortion used in combination with a heavily driven amp plays a big role in his tone. If you want to work towards the same tone, you will want to have a valve amp you can really push. Needless to say, Hendrix never played the above amp – it’s just to give you an idea what type of amp to look for. A 40 watt all valve combo like the Marshall above will definitely give you a good starting point to achieve a Hendrix-like tone. I know I will get emails from people if I don’t include this so I’ll quickly mention strings. 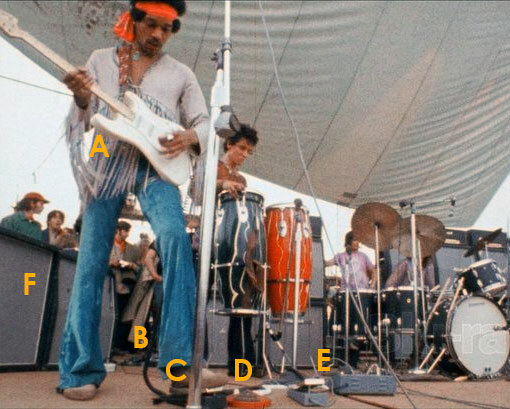 Jimi Hendrix used Fender Rock ‘N’ Roll light gauge (.010, .013, .015, .026, .032 and .038.) strings (according to Roger Mayer). So if you want that exact setup you will need to buy the strings individually because I couldn’t find a set with that exact combination. Even if you’re a die-hard Hendrix fan, you should choose the strings that feel good to you. While string gauge does impact your tone, how the strings feel is far more important to you as a guitarist. If you like strings far heavier than the gauge listed above, stick to what you like instead of changing just because Hendrix played lighter strings. Now that we’ve gone through the essential effect pedals Jimi Hendrix used, let’s look at how to experiment with how you chain them together. A key principle I would like you to take away from this guide is to experiment with your gear. That’s what Jimi did and why he was such an inspiration to guitarists for decades. No doubt if Hendrix lived longer he would have continued to experiment and try different effects and configurations. So let’s start by looking at how to experiment with your effects chain. The exact models you choose is completely up to you. As long as you have these four main pedals, you will be able to achieve a great Hendrix tone. This rig is based on the photo shown earlier. It’s a standard setup and a good starting point. It’s very typical to run the guitar directly into the wah before running it through any other effects. It’s also interesting that the Uni-Vibe comes after the Octavia and the Fuzz Face because that means the Uni-Vibe is being fed a driven signal. 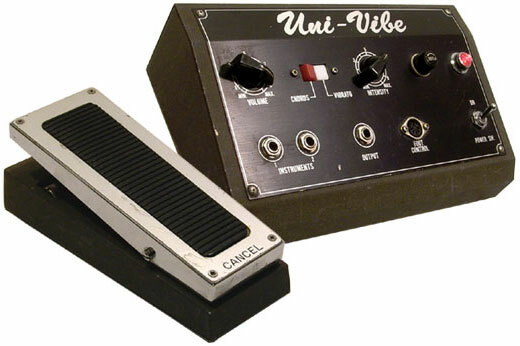 If you had the Uni-Vibe before the fuzz, the fuzz would break down the effect produced by the Uni-Vibe. I have heard many reports that Hendrix would sometimes place the Fuzz Face before the wah. Although I haven’t seen it in any photos, it makes sense that this type of experimentation happened. Placing a distortion or overdrive pedal before the wah can dramatically change the final tone. With this setup, the wah pedal is being fed a distorted tone and all the new harmonics produced by the distortion are picked up by the wah and altered. It’s worth experimenting with this setup as you may like the way that the wah responds to the distorted tone. This time we’re pushing the wah further down the chain to see how it responds to having both the Fuzz Face and the Octavia in front. Expect a very messy tone depending on how much drive comes from your amp vs your fuzz pedal. Some guitarists actually prefer this setup as the extra harmonics and fuzz coming into the amp really give it an extra edge. Remember that the Octavia is producing a mixed signal one octave higher so this is also being fed into the wah. In this setup we switch the positions of the Fuzz Face and the Octavia to see how the Octavia responds to the distorted signal. Experiment with cranking the drive up on the Fuzz Face and hear what happens when the Octavia is activated. Also play around with the fuzz level on the Octavia with the Fuzz Face off to hear how it affects your end tone. It’s very unlikely you will prefer hearing the Fuzz Face before the Octavia but this type of experimentation is important so you understand how your effects pedals interact together. There are other combinations you can experiment with such as moving the Uni-Vibe up the chain, but you’re unlikely to enjoy the results. If your amp has an effects loop, you can also experiment with taking pedals out from the chain before the amp and place them in the loop. This will help you understand how the pedals interact with the amp’s drive. Don’t feel you have to copy Jimi Hendrix’s rig setup exactly to produce his tone. If you find you prefer a different order of pedals then you should do it. Hendrix’s clean sound was just as iconic and inspiring as his heavily driven sound. In the studio he no doubt had a different rig set up for clean sounds and used a range of different amps set to specifically produce a clean tone. But when he played live he used the exact same rig as what is described above. So let’s look at how he produced his cleaner tones during a live performance. This is the main reason why I hear people complain that they can’t come close to Hendrix’s clean tone. They set up their amp with a separate channel for their clean sound. The reason why this doesn’t sound quite right is that the clean channel removes the majority of the warmth they had when it was heavily driven before. They end up with a nice sparkly clean tone, but it just doesn’t give that Hendrix vibe. When you want to produce a clean Hendrix tone, I recommend leaving your amp at its normal driven tone (not too high gain) – you’ll see why in a second. Instead of switching to a clean channel on your amp, the trick is to dial back the volume knob on your guitar. You will end up with an incredibly warm and rich tone with a slight drive when you hit the strings harder. This is what Hendrix did live for his clean tones and if you watch his Woodstock performance you will see him roll the volume back at times. Depending on your amp settings you may not achieve a sparkly clean tone – but it will retain the Hendrix vibe and you will definitely enjoy the tone. While you can use any pickup, you will find the middle or neck pickups get closer to a Hendrix tone. If you don’t have a strat – just remember that Hendrix played quite a few different types of guitars so experiment with the pickup choices, tone knob and where you pick the strings. When you do want to play with a clean tone – experiment with using the Uni-Vibe to build texture. While it’s great fun to play around with a fast and lush swirly sound, a more subtle effect can really enhance your tone. Experiment with a low depth or volume level and adjust the speed to match the vibe you’re going for. Switch back and forth between Chorus and Vibrato mode and see how it changes the way you play. You will definitely enjoy a very subtle Uni-Vibe in your clean tone rather than direct guitar into a clean amp. The effect really helps you achieve that warm Hendrix tone. This might sound odd, but experiment with keeping the Fuzz Face on while you roll your volume knob down. Depending on how much fuzz you have dialed in on the pedal, you may prefer the clean tone produced with just a little bit of edge from the fuzz. Then if you want a cleaner tone, simply switch the Fuzz Face off. But it’s worth playing around with keeping your pedals on and seeing how clean you can get your tone by rolling your volume knob down. The effects covered above are the main effects Hendrix used. But he was well known for experimenting with different effects in the studio. So let’s look at how you can experiment with adding different effects to the above rig. Some of these effects I’ll cover were used by Hendrix at one point or another. Other effects only became available after his death. Hendrix no doubt would have continued to experiment with different effects if he lived longer and may have experimented with some covered below. I recommend you make it a habit to experiment with different effects. It might be hard to imagine Jimi Hendrix using a Digitech Whammy Pedal, but if it was available to him he surely would have tried it. Jimi Hendrix didn’t use delay very often but you can hear it from time to time. All along the watchtower gives a great example of how Hendrix used delay (read my guide on the effects used in All Along The Watchtower here). Guitarists today tend to use delay to enhance their main tone and often leave it on constantly as a way to thicken their sound. Hendrix used it as an effect like any other. That’s the mindset you need to switch to if you want to experiment with delay. Don’t leave it on all the time – use it to enhance certain sounds and parts and use it as a creativity tool. Also experiment with placing delay at different points in your effects chain. The best practice is to place delay towards the end of your chain. But experimenting is how you discover cool new sounds. Place it before the Uni-Vibe or Octavia and see what happens or see what happens when it is placed before the Fuzz Face. It might sound terrible, but it’s worth experimenting. 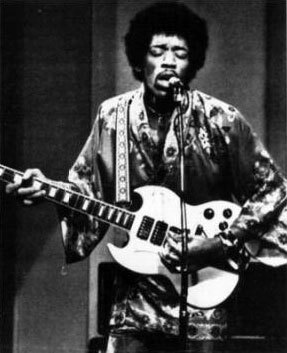 Temporarily forget how guitarists today use delay and experiment like Hendrix would have. I recommend experimenting with tape delay, slapback, reverse and any other analog delay you can find that might have been interesting to Hendrix. 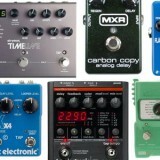 As an example, the photo below shows the delay types available on the TC Electronic Flashback X4. Pretty much every delay type found on that pedal would have been interesting to Hendrix. It’s not hard to imagine him experimenting with a Ping Pong, Reverse or Space delay – you can get some pretty psychedelic effects from those effects. Alternatively, you could look at using delay pedals such as the Line 6 Echo Park or a simple analog pedal such as the MXR Carbon Copy. But I highly recommend experimenting with different delay types like those found on the Flashback X4 because you’ll have far more fun. A standard delay really won’t give you much freedom for experimentation. The first Digitech Whammy pedal was released in 1989 so unfortunately Hendrix missed out. But it’s not hard to imagine him experimenting with it and using it in creative ways. This is one effect I would’ve loved to see him experiment with as it’s been used in very creative ways over the last few decades. So while we’ll never know how Jimi would have used the Whammy, you can definitely experiment with one while playing with a Hendrix vibe. Check out my review of the Whammy DT to learn more about whammy pedals and this article for examples of songs that get some creative sounds out of it. 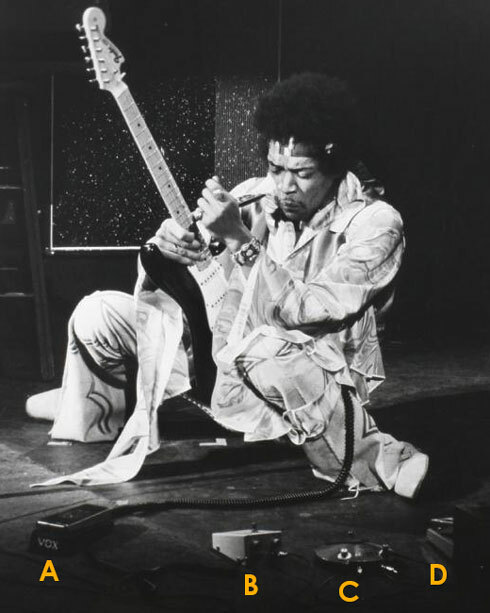 If you know what a talk box is, you should see why it’s a good effect to experiment with and one Hendrix would have really enjoyed using. If you haven’t seen a talk box before, it’s a really interesting effect. Think of it as a wah pedal controlled by your mouth. You literally place a plastic tube in your mouth and make sounds and it takes the sounds you make and uses them as a filter for your tone. Because it is a bit of a pain to set a talk box up you don’t see it used very often, but if you enjoy experimenting with different effects, check out the Rocktron Banshee Talk Box. The Uni-Vibe is a great modulation effect but there are plenty of others out there worth experimenting with. Chorus, phaser, flanger, tremolo, pitch vibrato, etc. are all excellent effects to experiment with and fit in with a lot of Hendrix’s music. There are plenty of pedals out there for each effect but I would suggest a pedal such as the Eventide H9 which has amazing quality effects or something like the Line 6 HX Effects to access a wide range of effects (including the popular MM4 modulation effects). The reason I suggest buying a pedal that can do a range of modulation effects is that you probably won’t use them all the time. It makes sense to buy a pedal that can give you a range of different effects instead of having separate pedals that are only rarely used. There’s a lot of information in this guide and it might feel overwhelming with all the different gear options. So I’ll summarize by talking about the main points I want to leave you with that will help you enjoy a Jimi Hendrix tone. Don’t stress about finding exact models for different effects. 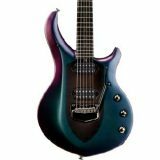 If you look on some forums you can see guitarists argue about strings and what custom pickups produce the best Hendrix tone. Don’t be fooled into thinking that you need to go to that extreme to sound like Hendrix. While the basic gear you use is important, you can produce a great Hendrix tone on a wide range of guitars, amps, and pedals. Remember that Hendrix didn’t always play a Stratocaster into a Marshall – he played a wide range of guitars and amps. If you already have an amp and don’t want to buy another one, that’s fine – you can still achieve a great Hendrix tone. If you really want to sound like Jimi Hendrix, study his music. Learn to play his songs then learn to improvise as he did. Watch videos of his performances and watch documentaries. Analyze his music and try to understand his chord or note choices. 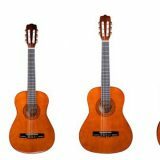 This guide focused on gear because that’s what this website is about, but a more important aspect is what you play on guitar. Even if you could go back in time and play Hendrix’s exact rig, you won’t sound exactly like him. 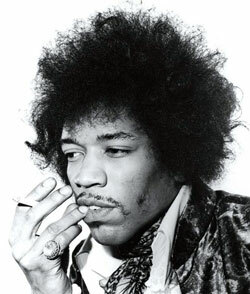 Likewise – if Hendrix could leap forward in time and play your current rig, he would still sound like Hendrix. Your mindset and how you think about music and guitar will determine what you sound like. So put on a Hendrix backing track and jam along. Put yourself into his shoes and imagine what he would play. It’s great fun to be able to play a Hendrix song and sound just like him, but that shouldn’t be your end goal. Use the gear covered in this guide as a way to learn to grow as a musician. Experiment with the gear in the same way Hendrix would have experimented with it. Add in new effects that weren’t available in his time and see what you can come up with. Create your own version of a Hendrix song and give it a different direction or sound. Learn to sound like Hendrix then use that experience to improve your own understanding of music. I’ll be adding to this guide in the future so good luck applying the advice and if you want to stay up to date with new lessons, guides and reviews, subscribe to my newsletter. A key part of what made Jimi Hendrix inspiring to guitarists is how he experimented with guitar effects, sounds and tones to create music. A lot of his iconic songs wouldn’t exist if it weren’t for the way he used guitar effect pedals. 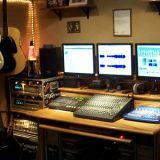 This Guitar Effects Course gives you a complete overview of the most common types of guitar effects available, how they work, where to position them and how to dial in a great sound. If you want to get the most out of every pedal and craft a great tone, check out the course. The more you understand guitar effects pedals, the easier it will be to use them as inspiration for Hendrix-like ideas and licks.